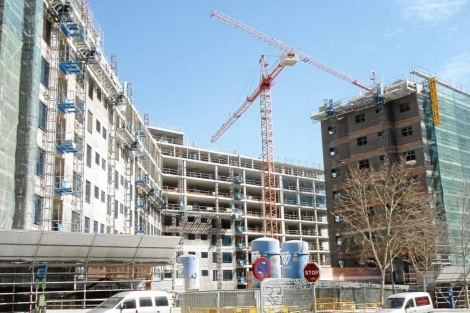 The research department of BBVA – Spain’s second biggest bank – say the construction sector is still weak, but claim that “the process of supply adjustment is practically finished.” Which means they think that the collapse in planning approvals is coming to an end. Planning approvals are down more than 95pc since the peak of the boom. There is almost no new building in Spain today. The sector has effectively been wiped out. Nevertheless, BBVA don’t expect a quick rebound in new housing starts, taking into account the “high volume of oversupply of homes, and the difficult financial situation of companies in the sector.” That’s a polite way of calling many of the developers zombies. BBVA were “pleasantly surprised” to find that housing starts went up month-on-month 14.5pc in Jan and 8.6pc in Feb. But planning approvals in Jan-Feb were still 19.2pc down on the same time last year. What was the research department researching ? when any one walking in any town, village in Spain could see buildings coming up. I’ve stopped doing the visados / planning approvals every month. Now I just do them every quarter. This was just a news item that I decided to mention. However, I can almost guarantee you that approvals are still just a few thousand a month, 90pc down since the peak. The Spanish construction industry is basically dead for now.